DUBAI, UAE (CMC) — West Indies off-spinner Sunil Narine has broken into the top 10 of the latest International Cricket Council Twenty20 player rankings. 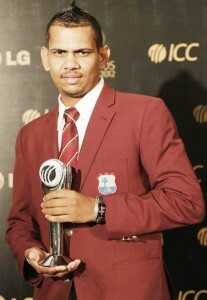 Sunil Narine with the Emerging Cricketer of the Year award. The wily Trinidadian bowler rose three spots in the rankings released Saturday, to be joint 10th with South African speedster Dale Steyn. Narine’s last T20 International was against Bangladesh earlier this month when he finished wicket-less from three overs. He has so far taken 16 wickets from 13 T20s in his fledgling international career. West Indies captain Darren Sammy is the second highest-ranked West Indies bowler at 24th. Pakistani off-spinner Saeed Ajmal has maintained his stranglehold on the number one spot in the rankings. In the batting, West Indies’ Marlon Samuels has risen one spot to sixth, while Chris Gayle remains unmoved in third. Australian Shane Watson tops the rankings ahead of New Zealander Brendon McCullum. In the Test rankings also released, veteran West Indies left-hander Shiv Chanderpaul has continued in second spot, with teammate Samuels and Darren Bravo rising by one to 18th and 19th, respectively. Fast bowler Kemar Roach is the highest-ranked West Indies bowler at 12th. Australian Michael Clarke heads the batting list, while Steyn tops the bowling tables.